The gift sets are here! The gift sets are here. The gift sets are heerrreee. 2018 went fast. I feel like I say and think this every year, but hot dang, it’s November. I pretty much can tell that it’s November based solely on seeing the holiday gift sets roll out. Ha! It’s my sixth sense. I wanted to share the best of what I’ve seen so far for value sets and Black Friday deals. 1 | Jack Black ‘The Squad” Trio Skincare, $16. This is a set that I just purchased for myself during the VIB sale and I’m considering getting another one for my boyfriend. I bought him a few things from this brand and he loved them. Everything in the line has a great texture, always light but hydrating. This is my go-to face moisturizer with spf. It’s a great size for traveling. We have a trip coming up so I got one for myself and now feel slightly guilty I didn’t pick one up for him also. This is a generous set, especially considering the under $20 price tag! It has a full size lip balm (in mint-shea butter, my 2nd fav flavor, normally $7.50), a 1.5 ounce face moisturizer with spf 20 (normally $18), and a 1.5 ounce glycolic facial cleanser. 2 | Bite Beauty Mouse Bouche 4 Mini Lipsticks Set, $25. The Bite Beauty lipstick holiday sets always deliver. I purchased a set two years ago and still use them regularly. The tubes are .05oz each, so about a third the size of a full size lipstick. You get .2 oz total for $25, a full size is .15oz of product for $26. So you essentially get another 1/3 of a lipstick for free. The four mini tubes are perfect to try shades you want to test, but wouldn’t necessarily buy a full size of right away. It forces me outside my comfort zone of neutrals and reds and makes me try more mauve and brown shades. The formula of this Bite Beauty lipstick is so creamy, hydrating, and pigmented. You only need one swipe for full coverage. I LOVE these for going out, the compact size is perfect. I stash one with a lipliner in my purse and they take up almost no space. 3 | Hourglass Confession Refillable Lipstick Duo, $34 (value $56). I feel like beauty companies realized that people wanted really wearable shades in value sets. As fun as a purple lipstick is, I’m not going to wear it everyday. This Hourglass duo has two of the most stunning, wearable, gorgeous shades of mauve and brick red. Mauve is a great “my lips but better” shade and brick red is a very easy red tone to wear if red lipstick intimidates you. They also come with a limited edition rose gold tube. You click in the shade you want to wear into the tube. These lipsticks are refillable. Meaning when you run out, you just have to purchase a lower priced refill to pop in the tube. Hourglass is a environmentally conscious and cruelty-free brand and most of their products are vegan. These lipsticks are vegan, meaning no animal by-products went into making them. This is a crazy deal to get these lipsticks for $17 each. They are normally $34 each with the tube and $22 for the lipstick refill. 4 | Anastasia Beverly Hills Glow Kit, Sundipped, normally $40, on sale for $24. I can not tell you how excited I am for this deal. 1: this is one of my favorite highlighting kits. The colors are out of this world pretty and the pigment is just right. So shiny and pretty and adds so much pop in photos. 2: it’s already a crazy good deal at full price, in my opinion. You get 4 full size highlighters for $40. With the 40% off sale, you are getting them for $6 each. That’s a better deal than drugstore prices! This highlighting set is one of my favorites. It’s a makeup must have and I highly recommend getting one for yourself and a few for friends who love makeup. It’s a generous gift at a great price. 5 | Living Proof Perfect Hair Day Dry Shampoo, normally $23, on sale for $11.50. This dry shampoo is one of the best on the market. It does actually clean your scalp, all without leaving a ton of powdery build-up. For a spray can, I feel like it actually lasts me a decent amount of time. Maybe because it cleans so well, I don’t end up using as much as I do with other brands. It’s a great dry shampoo and a great deal at 50% off!! 6 | ghd x IGK So Extra Gift Set, $249 (value of $401). Well, this might be my favorite value set. You all knows I’m a HUGE fan of the ghd line, and this set is unreal. It contains a platinum version flat iron, which is already $249 on it’s own. Then it ALSO contains my favorite brush on earth, the paddle brush (normally $55). It has a heat protect silicone mat, great for travel and protecting your counter tops. It also has four ghd hair clips, perfect for sectioning your hair while styling. AND it has four travel size hair products from IGK: a dry shampoo, texture spray, hair primer and hydrating hair balm. Hot damn. This is how you do a value set. 7 | By Terry Gem Glow Ombre Blackstar Eyeshadow Stick Set, $95. By Terry is a luxury brand that is well loved. It’s generally a bit far outside my budget, to be honest. But this set 1: brings each shadow stick down to $32.67 each, normally $38. Is this the biggest deal out of all gift sets? No. But what it is, and why it makes the list, is because this is a brand that never goes on sale. 2: each shade is in this gift set is SO wearable. These are the best everyday shades. I swatched these at a Space NK holiday event and was so impressed with the colors. The other thing I love about these shadow sticks is that they LAST. I’ve swatched them on the back on my hand before at the beauty store, come home, showered, washed my hands throughout the day, and by the evening they are still perfectly in place. These really stay on. 8 | Revlon One Step Styler, $29.99, normally $59.99. I just recently purchased this and have a full review coming. This is a great dryer for those moments you have soaking wet hair and need to be out the door in 30 minutes. I wouldn’t use this daily, as I try to only use hot tools, blow dryers included, 1-2 times a week max. It gives you a salon blowout at home and is manageable for non-hair stylists because you don’t have to use a separate blow dryer and round brush. 9 | Sephora Collection Lip Stain Collection Set, $28 (value of $84). These Sephora lip stains are one of the best long wear lipstick formulas on the market. They don’t dry out your lips and they make an amazing base for a traditional lipstick, if you like to layer shades and add dimension. This six lipstick set is a great deal. Each lipstick is normally $14 each, so you are essentially getting four tubes free. Even if a shade doesn’t feel like a 100% fit for you, you can always layer it under another lipstick to create a shade that works. The deep red/purple toned shade would be so pretty under a classic red lipstick shade. 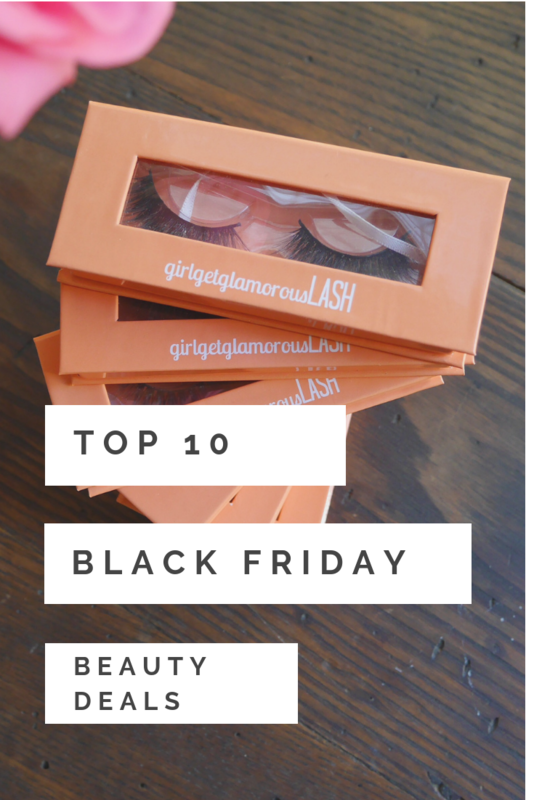 10 | girlgetglamorousLASH combo box, 4 sets of lashes, $40 (value $85). I honestly didn’t plan on doing this deal, but as I was writing this post, I realized I wanted to do something nice for the ggg squad: the OG’s who have been with me since the fuzzy mirror selfies and the new gals who might have just found the blog through my hair color posts. I truly appreciate you all. I’m so glad the blog is helpful and useful and fun and you decided to stick around! I love these lashes so much. They look so good on, like your own lashes but longer! I cut the last 1/4 off of each strip to make mine look even more natural and have a perfect fit. They are cruelty-free and can be worn up to 25 times. That is for real. If you apply them carefully and take them and the glue off carefully, you can seriously wear them this many times. The bandand lashes are made from a really cool faux silk material that makes them really soft and durable. Make sure to apply mascara first to your natural lashes, and not on the lashes themselves to help them last the longest. From now until December 16th, ggg readers exclusively can get this deal. Make sure you are subscribed to the girlgetglamorous blog newsletter below! The combo box includes our best selling lash styles: Double Tapped, Baby Gurl, ggg, and Head Honcho. The total value is $85! How to get the deal: 1 – Add all four styles to your cart and then 2 – use code: gggOG at checkout to get $45 off your lash order!! Thank you so much for reading! I hope you have wonderful holidays and fun shopping all the deals! Burt’s Bees Just Stepped Up Their Lip Game.